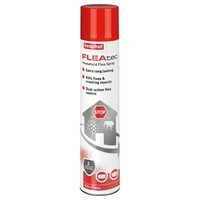 Beaphar FLEAtec Household Flea Spray is a premium flea control product that can be used safely and effectively in your home. Designed to quickly kill adult and larval fleas, and leave a lasting efficacy, Beaphar FLEAtec Household Flea Spray contains a fast-acting insecticide to kill adult fleas and an Insect Growth Regulator (IGR) to prevent the flea eggs or larvae from maturing into adults for up to 6 months. Beaphar FLEAtec Household Flea Spray is also effective against other crawling pests such as cockroaches, ants, crickets and silverfish.